Pros and cons are usually subjective but in the case of home additions, they’re somewhat universal. Here are some things to consider if you’re considering adding some space. Obviously, home additions aren’t cheap. Many homeowners decide to build when interest rates are low aka they can take advantage of home equity loans. But a vastly overlooked factor is the additional costs of utilities and taxes that will go into your annual budget. It’s said that you can get back the cost of a mid-range home addition when you sell. But even though the extra space could increase your home value, you probably wont recoup your entire investment due to do other variable involved with property values. In fact, with the exception of wood deck additions, most midrange home additions generated a 60 percent to 70 percent return-on-investment in the 2009-2010 Cost vs. Value Report (Remodeling Magazine). 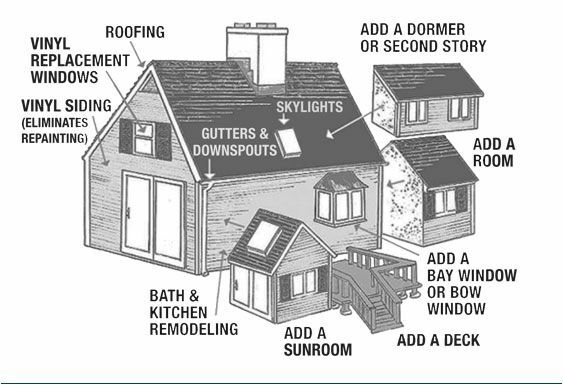 Take into account how much an addition will improve the functionality and overall enjoyment of your home. It goes without saying that any type of home reno is stressful and an addition is no exception. But remember, stress is temporary and if you work with the right contractors and plan carefully, you’ll help reduce the headaches. Weigh the enjoyment you’ll get out of the space with the stress of building it – if it’s overwhelmingly tipped in one direction you have your decision. So with these things in mind hopefully you’re better equipped to tackle your addition. Good luck!